I got problems to start the engine when I have not used it for a week or so, find that the battery was out of power, it looks new but something wrong with it. And it was also only a 60 Amph capacity, it should be a 74 Amph battery. I bought a new 74 Amph Bosch battery and luckily it was a 25% discount these Christmas days and a three years guarantee. After a week without use I tried to start the engine today with minus 13 degree Celsius outdoor temperature, no problem, it started direct! The battery is placed on the right side, just below front window. 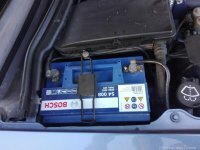 I have found even with the new battery the car can be difficult to start when it had not been used for a couple of weeks. About three weeks in summer and one or two weeks in winter when cold. After have reading on internet for the corresponding Mercedes SLK I found that they say that Mercedes had problems these years. The electronic devices take to much current. Maximum shall be 0.09 Ampere or 90 milliamp. I connected a Ampere meter and found it took about 0.3 Amperes, that's too much, but I think I didn't wait long enough time to let the current go down. With a current of 0.3 Ampere the battery shouldn't last for at most a week. I will measure it up more carefully later, but I don't think there is any problem with leak current, I just have to live with this because it's in the construction. They also give the recommendation that always have a fresh battery, replace every three years. The battery life time will goes down if it's deeply uncharged. From now and on I will always disconnect the battery or take it out and set it under charge if I will not use the car for a couple of weeks. When I replaced the battery I also see that the cooler wasn't centered. I found that there is a clip missing on the left side.